As it gets hot out we’re all reaching for cold beverages to cool us down. Here, four simple syrup recipes to sweeten any drink, from a sparkling non-alcoholic mint lemonade to a boozy Mojito. Plain simple syrup is a 1:1 ratio of sugar and water, simmered until the sugar dissolves. This is crucial for sweetening cold beverages since sugar crystals won’t dissolve easily in icy liquid. Simple syrup is a bar staple, used in ice coffees and cocktails alike. While I’m sure you can buy it bottled at Whole Foods and Trader Joe’s, it takes just minutes to make at home. And once you have this easy base down, the possibilities to play are endless. Make the simple syrup, add whatever flavoring you want, remove from the heat, and allow to steep. You can even play around with what kind of sugar you use (I did!). Syrups are a great way to preserve summer’s herb bounty. For a recent cocktail get together I made three variations, each with a particular drink in mind. Ginger syrup was created to make a ginger-lemonade highball. Mint syrup was to sweeten a South Side. And Sage simple syrup was for a personal creation, an arak cocktail flavored with grapefruit and sage. As the night went on, however, we got creative and new cocktails were born. And in the days that have followed I’ve discovered their infinite uses to flavor sparkling, non-alcoholic drinks that instantly energize and refresh me. Oh, and I made grenadine as well. It’s easy, really nothing more than a simple syrup made with pomegranate juice in place of water and a 2:1 ratio instead of 1:1. And like that, a Shirley Temple awaits! Or a Rob Roy, if that’s more your style. For now I will leave you with the syrup recipes and let your creativity get the best of you. Over the next few days, maybe even weeks, I’ll post drink recipes that take advantage of these great flavor boosters, both alcoholic and non-alcoholic. Perhaps I’ll launch a Friday cocktail post to start all of our weekends off right. What recipes would you use these syrups in? And I’m not the only one thinking about ice cold summer drinks. The blogosphere is abuzz with delightfully refreshing beverages that you want to drink right through the screen. Two weeks ago Smitten Kitchen posted her Vermontucky Lemonade and I’m still thinking about it. On the non-alcoholic front, Bitchin’ Camero shared her frosty Mint Limeade, Gluten Free A-Z has Frozen Watermelon Smoothies, Kitchen Konfidence posted his Watermelon Basil Aqua Fresca, and Never Enough Thyme penned a recipe for Strawberry Lemonade. For you Boozehounds, Kitchen Riffs wrote about the classic Pimm’s Cup and Cookin’ Canuck goes classic summer with Frozen Strawberry and Lime Daquiris. Oh, and a month ago The Yellow House enchanted me with a rhubarb-prosecco cocktail. Even Food52 is in tune, with this week’s challenge being “Your Best Soda Fountain Recipe.” What summer drink recipe have you posted recently? Leave the link in the comments so I can check it out! Cheers! All four recipes yield about 1½ cups. They can easily be doubled or halved as long as you keep the 1:1 (or for grenadine 2:1) ratio. Combine water and sugar in a small saucepan or pot and bring to a simmer over medium heat. Stir occasionally, until the sugar is fully dissolved. (Be careful not to leave the syrup unattended or the sugar may burn or it may become too thick.) Remove from the heat and allow to cool to room temperature. Transfer to a glass jar or bottle (I find a funnel useful in these instances) and store in the refrigerator. Make simple syrup as advised above. Add the ginger to the pot, stir, and remove from the heat. Allow to steep for about 15 minutes. Strain the ginger out and allow the syrup to cool to room temperature. Transfer to a glass jar or bottle and store in the refrigerator. Make simple syrup as advised above. Add the mint to the pot, stir, and remove from the heat. Allow to steep for about 15 minutes. 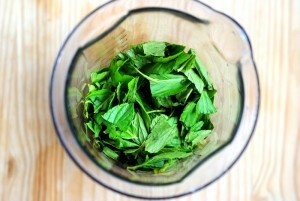 Strain the mint out and allow the syrup to cool to room temperature. Transfer to a glass jar or bottle and store in the refrigerator. Make simple syrup as advised above. Add the sage to the pot, stir, and remove from the heat. Allow to steep for about 15 minutes. Strain the sage out and allow the syrup to cool to room temperature. Transfer to a glass jar or bottle and store in the refrigerator. Bring the pomegranate juice to a simmer until reduced by half. Add the sugar and stir until dissolved. (At this point if you continue to simmer until it is reduced even further you will have pomegranate molasses.) Remove from the heat and allow to cool to room temperature. Transfer to a glass jar or bottle. Top with a little vodka if you'd like (this acts as a preservative to extend the fridge life). Store in the refrigerator. Thanks Manu! Go for it! And since grenadine is really just pomegranate syrup it’s more versatile than you’d think – you can drizzle it on pancakes, yogurt, eggplant, you’d be surprised! What a fabulous post! I have a yard full of mint and was looking for new ways to preserve it. I love the idea to make a syrup which could be used in so many refreshing summer drinks as you noted. Katherine, I appeciate your reference to my weekend post for Frozen Watermelon Smoothies! I think some of your simple mint syrup will be a nice addition to it! It’s supposed to be 95 degrees, hot and humid in Pennsylvania today. I think I’ll be making another batch of frozen watermelon smoothies with some of your refreshing mint syrup! Thanks so much Judee! I’m jealous of your garden full of mint 🙂 I didn’t even think of adding mint syrup to your watermelon smoothies but that is just genius! I can’t wait to hear all the fun ways people come up with to use these. Thanks so much! It’s definitely a great way to use up mint or other herbs. That sounds so pleasant! Thanks so much for stopping by Theresa! I bet Pender Island is beautiful this time of year (I haven’t been but I have family not too far off). Hi Katherine, thanks for stopping by my blog earlier. You’ve a very lovely blog. I love your syrup. I made my own syrup too but I only kept 2 of them. One is pandan flavour clear syrup and the other one is golden syrup. Yours sound really interesting too. Thanks for sharing. Hope to hear from you more often. Have a great day. Thanks so much! I’ve never heard of pandan syrup, fascinating! Thanks for stopping by! I love a good cocktail and these ideas for simple syrup are wonderful! Thanks so much Carolyn! I hope you get a chance to try them out. I’d love to hear what cocktails you enjoy! I love that ginger syrup..sounds really good, however grenadine sounds fantastic too!! !Thank you for sharing!!! Thanks so much Sandra! The ginger syrup was just delicious; I’ll post a recipe soon of a ginger-lemonade highball that really makes good use of it! Thanks for stopping by! Thanks Nami! It would be a fun project with the kids! And haha, good catch on the Mirin bottle – I always save all of my bottles for times like this. My husband made fun of me, but then they came in handy! Oh fantastic! Right now there are tons of elderberry blossoms about and I’ve been meaning to turn them into syrup. Hadn’t gotten around to finding a recipe yet, so was glad to see this. Mmmmmm. Mouth watering. Oh wow, elderberry blossom syrup would be just delightful! I’d love to hear how it turns out. That is so sweet! I never would have guessed you were a “newbie,” your blog is great! I love Indian food so will definitely be back often. Thanks for stopping by! This is an excellent post. I am saving this and will refer back now and then to try the syrups 🙂 Thanks a lot for your beautiful comment on my post! Thanks so much! No problem, I will be back to your blog often! It’s just lovely. Hope you enjoy the syrups! Thanks for the shout-out, Katherine—yes, simple syrups are so versatile (even not in summer). I love herbed simple syrups as well. Of course! Rhubarb and prosecco? Amazing! And you’re so right, simple syrup is good all year around. Well after reading this post-I am ready to experiment, the possibilites are endless. Thanks for posting! how long do the syrups keep? Excellent question! 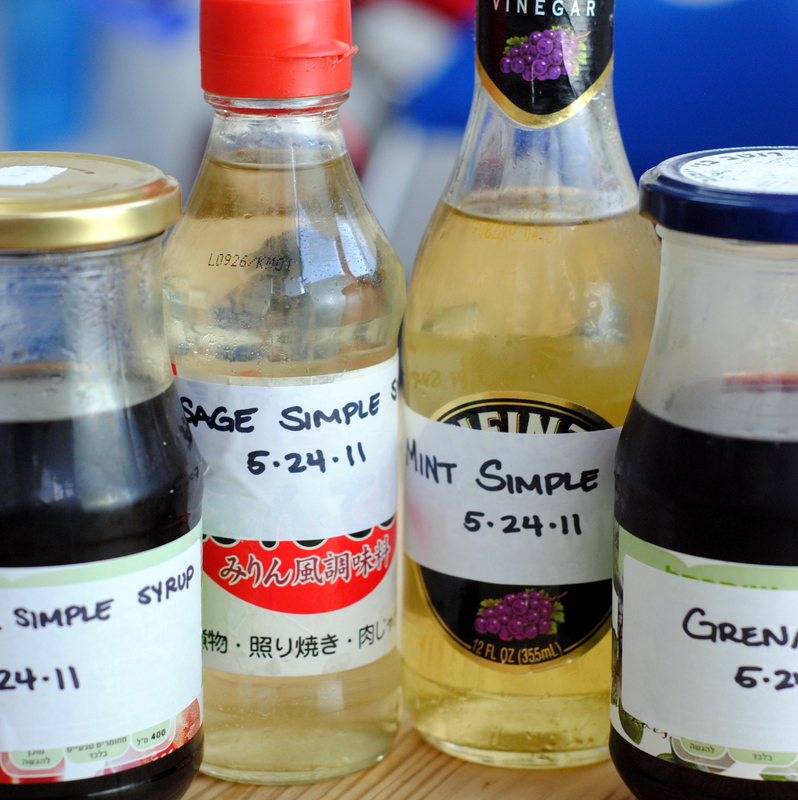 As long as you use very clean glasses to store them in, simple syrups should keep for months in the fridge. And the grenadine, especially when topped with vodka, will keep almost indefinitely in the fridge. I had a bottle of homemade grenadine in my fridge for seven months and it was fine… I always put a date somewhere on the bottle, and as it gets older just taste it before adding it to any beverages, just to be sure. I love making my own syrups for pancakes/waffles, coffees, lemonades etc., but I’ve never made grenadine. 😉 The thing is, I can’t stand the taste of pomegranate juice. Do you think I could substitute cherry juice instead? Hi Faythe – sorry for the delayed response! Vacation… :-\ I think cherry juice would be absolutely phenomenal. Let me know if you try it and how it turns out! Katherine, I love simple syrups! I keep a ginger syrup in the fridge at all times. I use it for homemade ginger ales and my Jamaican coolers. I’ve never heard of or would have ever thought of sage syrup. This would be a great syrup for sage tea and as you pointed out some cocktails. I’d like to know more about your cocktails! Great post! Hey Heidi – I do think the mint will brown, I usually strain it out. And I haven’t tried canning them, but even keeping them in a tightly closed glass bottle in the fridge it lasts for months in my experience.